I come to Phyllis for the possibilities of despair, for endurance, for the potentiality that remains in determined resignation (I can’t go on / I will go on). And for her poems on Lenin and Kropotkin and the persistent and potent failures of our revolutionary dreams – which to me always seem less failures than they do as-yet-unrealized potentialities, inviting, waiting just out of reach, lost and wandering somewhere in the labyrinth of the No. If the poem of the revolution remains unwritten, a failure, is it because the revolution itself remains unwritten, unfulfilled, an incomplete series of failed attempts? Given this is the second book by Collis on Webb’s work – after the 2007 title Phyllis Webb and the Common Good: Poetry /Anarchy / Abstraction (Talonbooks) – he might be coming dangerously close to producing as many pages on her and her work as she herself has published (see the 514 pages of her 2014 title, Peacock Blue: The Collected Poems, also from Talon). Her silence, as when the poems left her some three decades ago, is infamous, with each new collection of poems emerging after a longer period of silence than the one prior. While some readers still hold out a hope for new poems, most of us most likely know that the idea of that might be completely impossible (I had held out similar hopes for John Newlove, Artie Gold, David Phillips and D.G. Jones). Either way, one can take solace in the fact that Peacock Blue even exists, given her reluctance a decade earlier to publish a selected poems through Salt Publishing, a project Douglas Barbour had tried for some time to instigate. One can, perhaps, become a poet simply because one stumbles upon the right poem – even simply the right line of poetry – at the right time and place. Miss that particular arrangement of words on paper, at that particular moment, and perhaps the turn toward poetry would never have happened. For me, the turn was simply the strangeness and utter inexplicability of an oddly shaped book jutting off a used-bookstore shelf – discovered by chance, so it seems – filled with words I barely understood (some of them in ancient Greek in fact) arbitrarily splayed across its broad pages, its often isolate words surrounded by blank paper. It was the complete objecthood of the book, its unreadable thingness, that led me. I made a choice, or was chosen, and wrote back to that unreadability. Through describing visits out to see Webb on Salt Spring Island, Collis opens with explorations of Webb’s most recent work and slowly moves backwards, almost unraveling a series of threads from failure to becoming, writing her history in reverse. 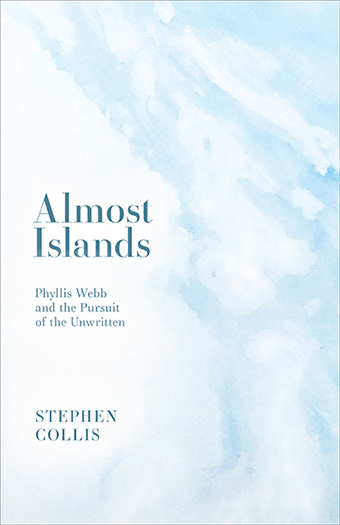 While seeking out answers, Collis appears instead to seek to understand the connections Webb’s writing (and not-writing) make to the larger outside world, from her influences and references, the geographies of her islands and the Indigenous populations there, to anarchism and the anthropocene. Almost Islands is a thoroughly-researched and considered book, and feels at times that he is so aware of his subject that the connections that might not have been otherwise made are simply, and casually, at Collis’ fingertips. Ideas, images and details click together, perfectly focused and purely described. Moving through Webb’s writing, research, interests and even her biography, Collis’ memoir is slightly deceptive: inasmuch as he writes a book about Phyllis Webb, exploring her work, her politics and her silence, it is also a deeply personal memoir about Collis’ own concerns of, and anxieties around, mortality, ecology, politics, anarchism and his own writing and potential silences. In that way, Almost Islands exists as a remarkably personal and most wonderful blend of essay and memoir, comparable to the best of works by writers such as Maggie Nelson, Sarah Manguso, Elisa Gabbert, Brian Fawcett, Myrna Kostash, Elizabeth Hay (her first three books remain my favourite) and so many others that have worked their own blend of essay/memoir into something that transcends the form itself. I don’t know that it’s appropriate to say that I have a “thesis.” It’s more a curiosity. In the 1960s Phyllis Webb sets out to write a book of long-lined poems with epic reach on Kropotkin. She makes little headway. In the silence following this stalled effort, through the 1970s living alone on Salt Spring Island, she becomes interested in Indigenous petroglyphs. She befriends local resident Beth Hill, author of Guide to Indian Rock Carvings of the Pacific Northwest Coast (Hancock House, 1975). And she comes into the orbit of two other people obsessed with Indigenous art – University of British Columbia anthropologist Wilson Duff and retired librarian and Salt Spring resident Lilo Berliner. Duff and Berliner both commit suicide within months of each other, the latter leaving her correspondence with Duff – including their discussions of a key Haida Raven story – on Webb’s doorstep before she walked off into the sea. The impact on the poet of Berliner’s suicide is profound. In 1980 Webb at last publishes a new book, Wilson’s Bowl, which shows the shattered trajectory of her thought and writing over the past fifteen years: fragmentary “Poems of Failure” on Kropotkin, and poems revealing in increasing fascination with Indigenous art and culture, as well as the physical and psychic fact of her residence in a Pacific archipelago, awash in Coast Salish history. To Russia, Suicide, and France we might now add Salt Spring Island, the place of abeyance – the choice of not-choosing. To read Webb, as I am trying to do, as a bellwether of the complexities of writing poetry on this far-flung and deeply entangled West Coast, is to confront a deeper problematic: How to write as a settler in the wake of colonialism – how to write, in this place, under the signs of liberty and justice, in ways that do not entirely erase the history of erasures? How to locate ourselves in the midst of an unsettling – in the table – and try to follow those threads that can be woven anew into lifetimes of mutuality? But, as poet Christine Stewart once said to me, maybe the question is not, what does it mean to write from here, but rather, what would it mean to stop writing from here? To cede the floor, step back, and truly open what has been closed. Maybe you don’t always have to write the poem you feel approaching your door. But maybe, sometimes, the poem you write is the unwriting of the poem you don’t. I thought, conceive of something so vast and complex, the writing of which would be so time-consuming – an impossible book perpetually knocking at my door – writing it would be like not being able to write at all. A simulation. An indefinite deferral. A sketch of a poem I will not have written. Which I will write, refusing even refusal. That’s the project. Next. I am putting on a brave face.